Hooray for Pears! We finally found a food that Julianna will eat off the spoon, mush up in her mouth & swallow. And she smiles after it! This has been a long time coming. I knew it would take time and we had to be patient ... but we finally found something she likes! We tried greenbeans, carrots, rice cereal, oatmeal & barley cereal, and Avocado. No dice. I called the pediatrican & they said to try fruit. Before we tried anything else new, we gave Julianna a rest with the solids for almost 2 weeks .. and then tried again last night with Pears. Bingo. We have a winner. Next up: Squash and Sweet Potatoes to celebrate Thanksgiving week. 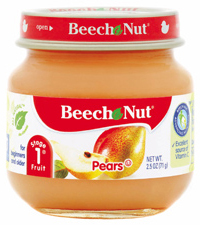 A side note about why I chose Beechnut: I did an excessive amount of research on what brand of baby food to feed our child ... and in the end, they are all the same ingredients, but of course I would never buy anything with added sugars, preservatives, salt, etc.... It seems all of those ingredients are void in the baby food that I have seen. Why Beechnut? The ingredients are the same for all brands. But, I like the idea (so far)of the tiny jars for stage one vs. a plastic container that some other brands use. It's easier to heat initially & then store the leftovers. It's not a plastic container & can be recycled easier since it's environmentally friendly. Yay! I'm glad you found something she loves. Sophia loves her pears! I just made her some today :) She's a good eater though, she has loved everything she has tried so far! Sounds good. She still looks a little dubious in the photo - awww! Hope she likes the squash! Aimee- I am hearing from several others that pears were their baby's favorites too! This is good to know! You are so lucky Sophia is a good eater... I am hoping Julianna will turn into one! It's still early though ... 6 months next tuesday. Yvette - Yeah I hope so too, 2 foods she likes would be even better! haha! That was another photo of her eating something else - I didn't take one of her eating the pears - figures. Well, I just tried feeding her Happy Baby Peaches and she likes it the most so far... but she still fought back after a while and asked for her formula! ow I'm thinking that she might be drinking formula til she is 14, lol!